Dinner’s done when you serve Vegetarian Stuffed Acorn Squash straight from the bowl. The stuffing is a protein-packed filling of farro, white beans, mushrooms and onions and topped with crumbled feta cheese. At least once a year I like to try something new with a winter squash. “Squad Goals” as my girls would say! This year’s Vegetarian Stuffed Acorn Squash Bowls were a big hit! So much so, that they will probably end up on the Thanksgiving or Christmas menu for my vegetarian and vegan family and friends. They are a new twist on an old favorite. Typically you find rice stuffing. But, I’m smitten with the chewy, nutty texture of farro that was used in Farro Pilaf with Cranberries and Walnuts. This “ancient” grain is a perfect alternative to rice…in almost any recipe, including this one. Winter squashes are plentiful during fall and winter according to my handy dandy Seasonal Produce Guide. Let me suggest that if there is just one new squash recipe you try before they disappear, THIS IS IT! To prepare the squash for roasting, slice a thin piece off the bottom so it will sit flat and pretty. Then, slice off the lid, about 1 inch down from the stem. Scoop out the seeds and stringy flesh and discard them. Place a small pat of butter in the bottom or brush the inside with olive oil. Keep the lid! Place the prepared squash on a baking sheet lined with aluminum foil or parchment paper. 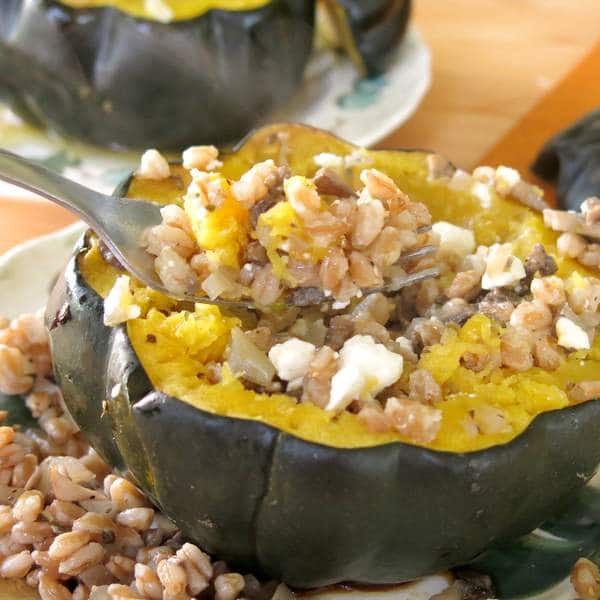 Each acorn squash is stuffed with a mixture of farro, mushrooms, onions and white beans. Cook the farro according to directions on the package. It will take about 30 minutes. While the farro is cooking, saute the onion and mushrooms in olive oil and oregano seasoning. When it’s done, add the farro and white beans to the pan. MAKE AHEAD TIP! Cook the farro and/or make the stuffing a day in advance and store in the refrigerator until ready to use. Fill the cavity of the squash with the stuffing mixture, keeping any extra filling to serve on the side. The squash pictured is about 4 inches. 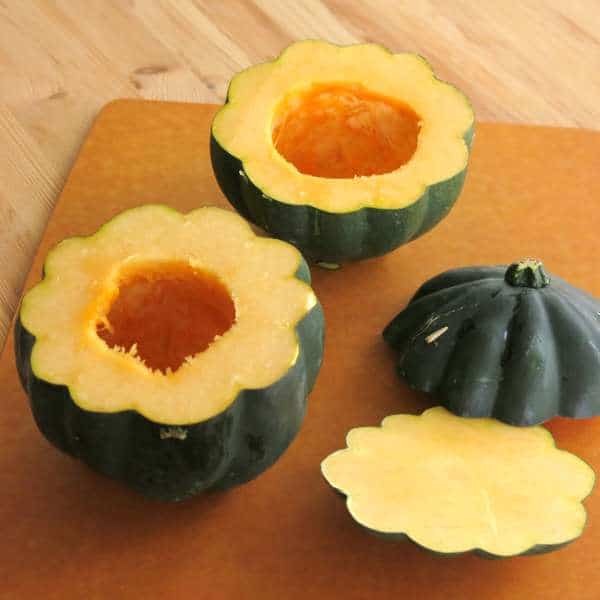 Place the top on the squash as it roasts in the oven, sealing in all of the flavors so they meld beautifully. Roast the squash in a 400 degree F oven until the flesh is tender to touch with a fork. Check for doneness at about 45 minutes. It usually takes about an hour. The vegan version of this recipe uses dairy-free butter. Another alternative is to brush the inside with olive oil instead. Sprinkle with nutritional yeast flakes, if desired, instead of adding any cheese. It is delicious without any cheese at all! 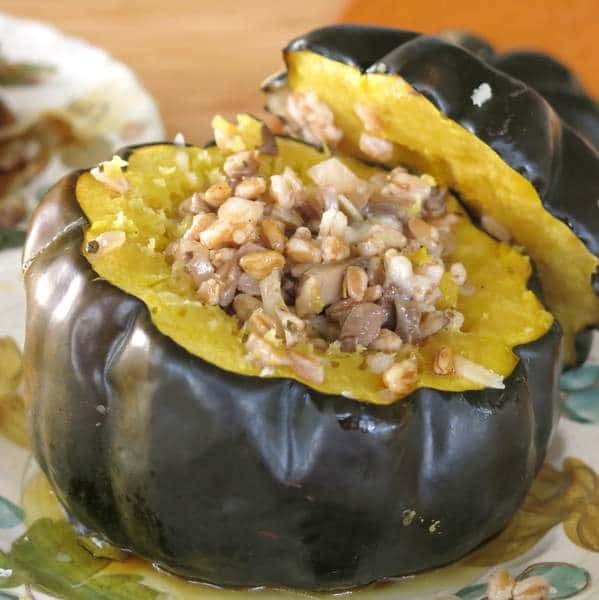 Try quinoa or brown rice; this Mushroom and Quinoa Stuffed Acorn Squash looks divine! Sub black beans, cannellini beans…most any type will work! Sit down and enjoy this roasted acorn squash “bowl” piping hot from the oven. 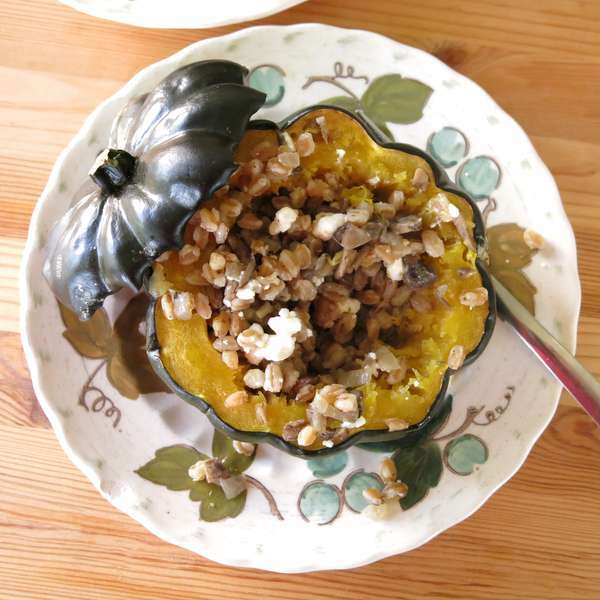 Scrape the squash from the sides and gently mix in the farro, white bean, mushroom and onion filling. Please rate this recipe and tag @DinnerMom or #DinnerMom on social media if you make this recipe. We love to see what you are cooking up! Serve Vegetarian Stuffed Acorn Squash with a protein-packed filling of farro, white beans, mushrooms and onions straight from the "BOWL" for a festive meal! Cut a small sliver off the bottom of each acorn squash so they will sit upright in the baking dish. Cut the top off of the acorn squash about 1 inch below the stem. Retain the acorn "lid" for later in the process. Scoop out seeds and stringy flesh and discard. Place 1 teaspoon of butter in the bottom of each acorn squash. 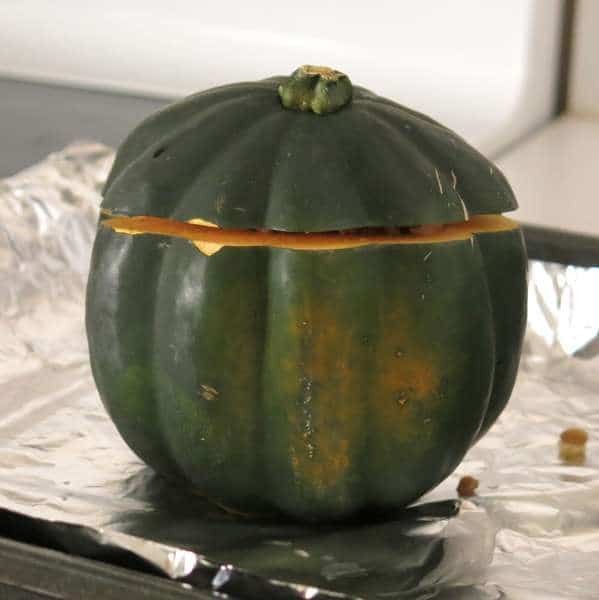 Place squash on a baking sheet covered with aluminum foil. Cook farro according to package directions. Drain and set aside when finished. While farro is cooking, heat 1 Tablespoon of olive oil in a large pan over medium heat. Add onions, mushrooms and oregano to pan and saute until tender, about 5 minutes. Add farro and white beans to pan with onion and mushroom mixture and stir to combine. Spoon stuffing into the cavity of each acorn squash. If there is leftover stuffing, and there may be depending upon the size of the squash, serve it on the side. Place acorn "lid" on top of each acorn squash. Roast in the oven for 1 hour or until flesh of the squash is tender to the touch of a fork. Check at 45 minutes. Open lid and sprinkle with feta cheese, if desired. 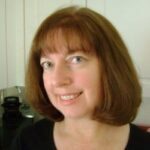 It is a fun presentation and just as easy as cutting the squash in half. Farro, squash, mushrooms and beans…yep, I know I’d love this! This is such a fantastic meal idea. Thanks! I’m partial to this combination too! What a beautiful and healthy dish! I luv this idea of using the squash as the dish…such an elegant presentation and luv the ingredients. I so love this, it’s so easy, beautiful, and healthy! Thanks! It’s a good dish for a healthy start to the New Year. Love that the squash serves as the bowl! I always enjoy acorn squash, but have yet to try farro. This makes me want to run right out and get some so I can make this delicious recipe! I love roasted squash and acorn squash is probably my favorite! Love farro too! I need to try farro, it looks so versatile! I would LOVE this! I’m always down with eating my bowls. With farro, roasted squash, mushrooms and beans. Oh, man. Yum. 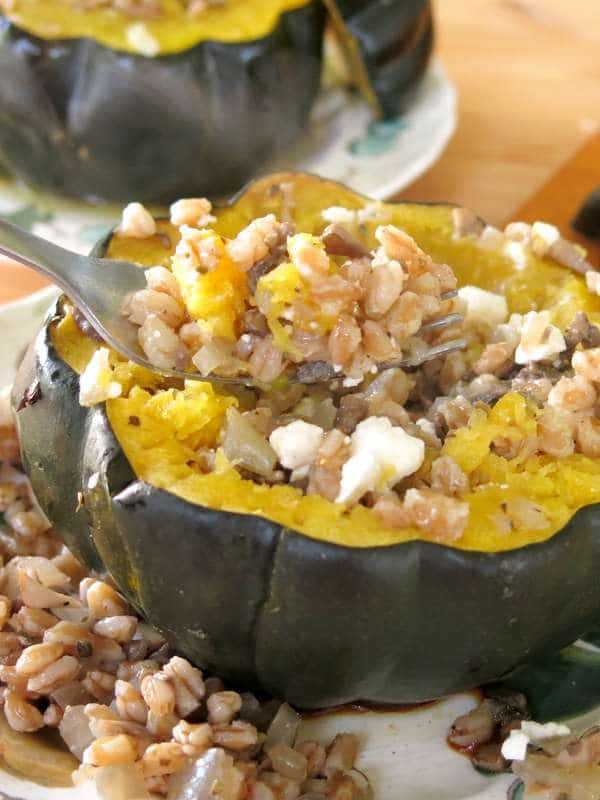 I love a good roasted acorn squash and love that you stuffed it with farro. SO pretty!! And the stuffing sounds wonderful! Oh, I want everything exactly how you made it, this sounds amazing. 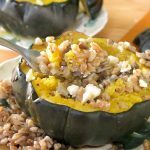 I love farro, and I love winter squash – YUM! I have been obsessed with farro lately. Love that you stuffed it into a fresh winter squash. I bought everything so I can make this this weekend. I love farro!